1. Fix my front screen door. It doesn’t close right. I just need to add the hydraulic thing on the bottom. Would probably take me (since I am not handy) like 2 hours. It’s been this way since last July and I think about it every time I go in and out of the house. So I know I am the only person who notices/cares that I never completed my caterpillar to butterfly experiment saga that I did with the kids this summer. You can go back and read “I“, “II“, and “III” here. 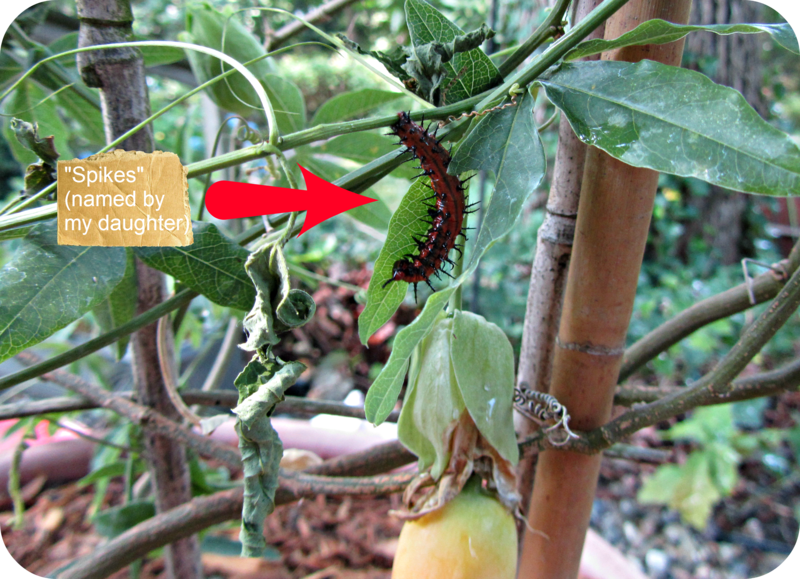 We put Spikes in the greenhouse on the passion flower vine that we bought just for him to consume. He ate and ate and he seemed pretty happy. Then he cocooned (picture needed) and was ready to be a butterfly. He was hanging from one of the leaves and we almost lost track of him. Then…..he was gone. Now I know you might be thinking, “Awwwww – he turned into a butterfly and flew away! Yay!”. No. We had the door to the greenhouse closed and it had only been about 2 days. Something ate Spike. A spider or something got him. Not really sure. Some bug predator. Not sure what I should have done different to protect him – maybe that’s just the way nature goes sometimes. If he was in an enclosed butterfly house he would have been okay. Maybe I should have put him in the butterfly box I made and just broke off branches from the Passion vine. I just thought it was cooler and more natural to have him wandering free on the vine like that. But I guess with more natural comes predators, too. So that ends the saga. It was not a happy one, but it’s an ending…and I can cross it off my to do list now.